Microwave oscillations of the magnetization around its equilibrium are the natural dynamical response to external perturbations (e.g. thermal fluctuations, microwave fields). This offer the promise for a new class of microwave devices, benefiting from their small foot-print, their ability to be controlled electrically, and their integrability with CMOS technology. Identified devices include local oscillators, microwave filters, detectors, and non-reciprocal devices. Understanding the dynamics of these nano-objects, applying general concepts of microwave oscillator techniques and defining from this novel microwave applications is the major aim of this activity. We are realizing and studying microwave emitting sources based on the magnetization precession, mainly in the shape of nanopillars made out of magnetic heterostrucures. This offer the possibility to build new devices for telecommunication in the Ghz range. 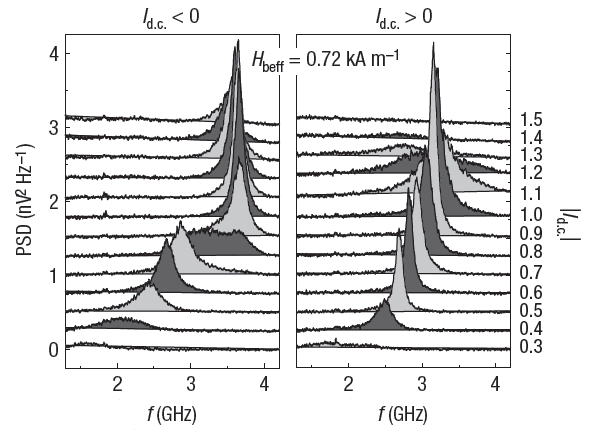 Magnons are the quasi-particles associated to the collective excitations of spins. 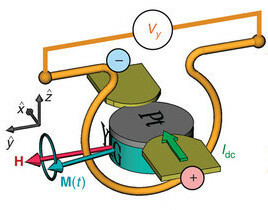 Mode engineering and transfer of angular momentum by magnonics current are some of our key ongoing research activities.